In a medium saucepan, heat olive oil over medium-high heat. 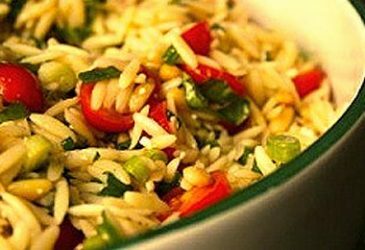 Stir in orzo, zucchini, pepper and carrot, cook for another 2 — 3 minutes. Pour in broth, lemon juice, lemon zest, and oregano. Stir to combine. Bring to a boil, then turn down to simmer. Stir occasionally, cooking until pasta is al dente, about 12 minutes. Stir in spinach and tomatoes. Continue to cook until spinach wilts and tomatoes are warm. Season to taste and serve.